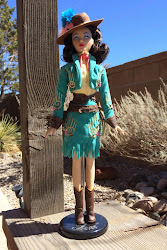 The sample dress is almost complete; here it is on Ms. Acme. I just need to complete the side slits and hems. It fits me a little differently, the bodice is less blousy and the skirt is not as gathered. Let's just say that I'm more voluptuous than willowy Ms. Acme (who is a Jr. form, after all). I promise, I'll post a picture of it on me once it's done. Here's a closer view of the fabric. As I mentioned in my last dress post, it's rayon that's jacquard-woven with palm trees and then overprinted with more palm trees. It has a great hand and it's wonderful to work with. However, I've discovered it's delicate, probably due to that gorgeous weave. In making this dress, I've come to the conclusion that it's going to be difficult to incorporate the beaded mesh if I make the wedding dress from this pattern. The bodice is lined to the edge, which requires sewing in small places and much pressing to lay flat. I don't think the mesh will hold up to it. The other issue is the waist, which is elastic. It's going to be difficult to put a casing in all the layers (lining, silk twill and mesh) while avoiding beads. Not that I consider this a fail. 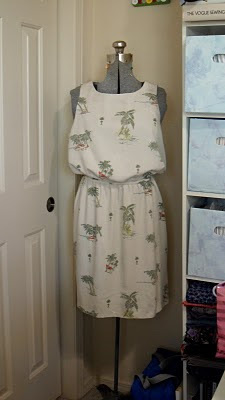 I love the dress I made, and it's going to Kauai for the honeymoon. DF really likes the style. The altered and tweaked pattern is versatile, so I'll be making it up again. So what about The BIG Project? I did do a lot of work with the My Hearts a Flutter top in working up the dress, so I'm going back to it for wedding attire. I've already made it once, so I know it fits. I can use the existing top to experiment with the placement of the mesh. The pattern has facings, which I can use to finish off the armhole edges thereby eliminating the turning/pressing problem. I can finish off the ensemble with a pencil skirt. The silk twill is heavy and firm enough for this style and I've done pencil skirts before. They aren't that difficult. And that eliminates the elastic issue. So there you have it. I've gone from a dress to an ensemble while the clock ticks away. But conceptually it works, so I'm not too nervous about it--it does keep me from obsessing over a million other wedding considerations! And if worse comes to worse, there's always RTW. Hopefully it won't come to that, because I just know there wouldn't be anything suitable in Albuquerque. Wish me luck! gosh, I love everything about this dress - that material is wonderful . That's a terrific dress. Perfect for honeymooning and travel to exotic places. Good luck with your wedding dress! This will make a great honeymoon dress...and good luck with your new vision. Personally I think the separates might be easier to accomplish - let's hope so cause I'm rooting for you to finish in more than enough time!